The simple dividend model assumes a constant rate of growth in perpetuity. It is possible to construct multi-stage models using forecast dividends and different rates of discounting. In the model above, the company forecasts a period of rapid growth over the next five years before dropping back to more modest growth. The dividend rate is 25.0 per cent and the income and dividends are shown on the Data sheet. The valuation by this method is 4.355 per share or 217.75 in total. The model is based on stable growth or dividends which last to infinity. This is a simplification: for example dividends cannot grow faster than earnings since it is unsustainable that dividends would become greater than earnings over a sufficient number of periods. 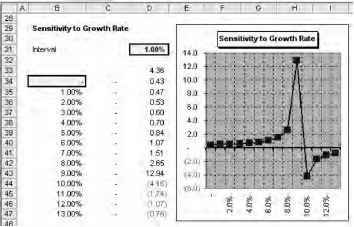 become negative if the growth rate exceeds the discount rate. The chart in Figure 14.5 shows a rapid increase in value followed by a dramatic fall above the growth rate of 8.5 per cent.